Cunard's Grill Suites - Fugazi Travel Agency Inc.
We invite you to experience luxury as it should be. The Grill Suite experience is truly refined. Guests will enjoy lavish suites and delectable cuisine, accompanied by impeccable service, giving personalized attention to every request. We invite you to experience luxury as it should be. 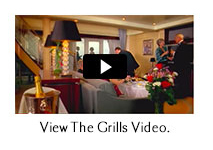 The Grill Suite experience is truly refined. Guests will enjoy lavish suites and delectable cuisine, accompanied by impeccable service, giving personalised attention to every request. Ships' Registry: Bermuda. ©Cunard 2016. The Cunard logo and logotype are registered trademarks of Carnival plc, an English company trading as Cunard Line. Queen Mary 2, Queen Victoria, Queen Elizabeth, and White Star Service are trademarks owned by Cunard. All rights reserved in the United States and other countries.